Lat 26° 20' 15N Long 127° 48' 9E Okinawa Island is the largest island in the the Okinawa Island Group (OKinawa Island) in the Ryukyu Islands (Nansei) in Okinawa Prefecture in Japan. Also known as Okinawa-hontō, Okinawa Jima or simply Okinawa. Roughly 700 miles to the south is the Philippines, and only 300 miles from the southern tip of the mainland of Japan. To the northwest is Ie Shima. On April 1, 1945 at 08:30am US Army and US Marine Corps troops land on Okinawa. 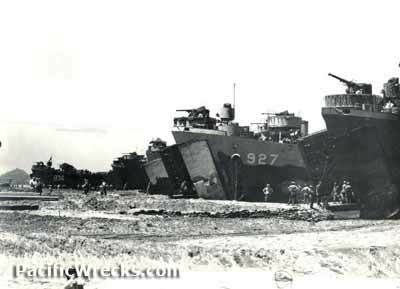 The defense of the island was divided into three strong Japanese defense lines where hidden guns, machine guns and bunkers covered approaches and fields. Soldiers on the ground fought a grueling battle to occupy the island. The Navy and its support ships where hit by kamikaze attacks from the air. The ground battle lasted 83 days officially ending June 22, 1945 when declared secured. The Battle of Okinawa resulted in 40,000 American casualties with 7,600 dead or missing. Of the 120,00 Japanese defenders, only 10,000 surrendered the rest fighting to the death. On Okinawa, an estimated 200,000 were killed, including many Japanese civilians caught in the battle, died with the military or committed suicide. Okinawa remained under U. S. military control until 1972 when returned to Japan. Naha (Nawa, Nafa) located in the southwestern corner of Okinawa, largest city includes Naha Airfield. Urasoe located to the north of Naha includes Kakuazu Ridge. Shuri (Shui, Syuri) located in the center of southern Okinawa, site of Shuri Castle. Moshinawa (Machinato) located in the center of the western coast of Okinawa, Moshinawa Airfield. Sobe (Subi, Suhi) located on the western coast toward the center of Okinawa includes Yontan Airfield. Kadena (Katena) located on the western coast toward the center of Okinawa includes Kadena Airfield. Itoman (Ichuman) located in the southern Okinawa including Buckner Monument and Peace Memorial Museum. Yonabaru (Yonahara, Yunabaru, Yonawa) located on the eastern coast of southern Okinawa. Nakagusuku Bay (Buckner Bay) located on the southern coast of Okinawa. Bolo Airfield located at Bolo Point on the western coast of Okinawa. Moshinawa Airfield (Machinato) located near Naha. Yontan Airfield (Yomitan, Yonzan) located near Sobe on the western coast of Okinawa. Kadena Airfield (Kadena AFB) located at Kadena near Yontan on the western coast of Okinawa. Yonabaru Airfield (NAS Yonabaru) located near Yonabaru on the eastern coast of the southern Okinawa Island. Motobu Airfield located on the eastern coast of Okinawa. Futema Airfield located on the eastern coast of Okinawa. Awase Airfield located on the eastern coast of Okinawa. Chimu Airfield located on the eastern coast of Okinawa.